In 12-inch nonstick skillet, heat 1 tablespoon of the oil over medium-high heat. Add chicken; cook 3 to 4 minutes or until no longer pink; remove from skillet, and keep warm. In same skillet, heat remaining 1 tablespoon olive oil; add broccoli. Cook and stir over medium heat about 3 minutes or until broccoli is bright green. Add garlic to skillet; cook about 30 seconds or until fragrant. Add chicken broth and tortellini. Heat to simmering; cook 3 minutes. Stir in milk, cream cheese, salt and pepper. Cook over medium heat 3 to 5 minutes, stirring occasionally, until cream cheese is melted; stir in Parmesan cheese. Add chicken back to skillet; cook 1 to 2 minutes or until heated through. Garnish with additional Parmesan cheese, if desired. Broccoli florets are sold prepackaged and can be trimmed to bite-size pieces, making this meal extra easy to throw together. Pasta sauce thickens as it cools. 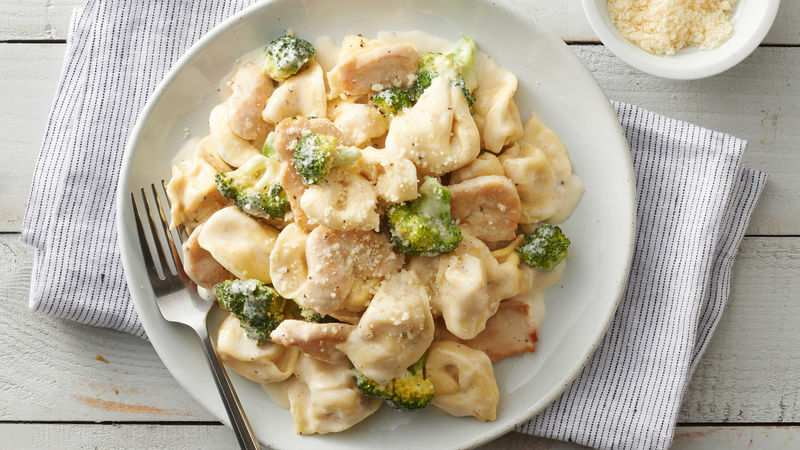 Counting calories doesn’t mean cooking twice when Cheesy Chicken Tortellini is on the menu. Cheese-stuffed pasta, chicken and a creamy sauce make this a comforting and filling dinner. One of the best things about tortellini is that it’s filling, which means meat goes further. Believe it or not, this recipe serves six healthy eaters using only one chicken breast. And yet it won’t set a dieter back either, it comes in at under 400 calories and boasts a 1/2 cup of broccoli per serving. So families can enjoy eating together, and home cooks will love the fact that this meal is ready to serve in 35 minutes, thanks to smart shortcuts like refrigerated tortellini. If you’ve never bought refrigerated pasta before, Betty has tips for buying, storing and cooking pasta. If you find tortellini is a hit at your house, check out more of Betty’s tortellini recipes.